Real estate prices in Croatia holiday regions have taken an interesting development in the last 10 years. While they were still at a very low level at the beginning of the new millennium, they reached their previous peak 2008/2009, to go back since then up to 30% due to the economic crisis in Croatia. However, there are still large regional differences in price levels, which the below study by Panorama Scouting outlines in more detail by the end of 2014. With the help of its partners, Panorama Scouting has performed an extensive analysis of the current real estate prices on the Croatian coast in October 2014. The current bid prices were analysed from a total of 1,760 houses and apartments along the Crotian coast and most of the islands, while quite significant differences in the prices per sqm showed up. The average home prices on the shores lie just under 2,100 € / sqm, however with significant differences by region and by qualitative residential areas. While you have to pay an average of 2,400 € / sqm in Dalmatia, you have to pay in Istria about 2,100 € / sqm and only 1,600 € / sqm in the Kvarner bay, especially in the central and southern parts. For sea views you have to spend on average about 450 € / sqm more than for those without sea view, for real panoramic sea views of course even more. For proximity to the sea you have to take a significant premium to buy in: prices on "Waterfront" (0-25m) are on average 3,400 € / sqm for "Close to Sea" (25-100m) at 2,100 € / m and for the more distant ones buyers pay approx. € 1,700 / sqm. 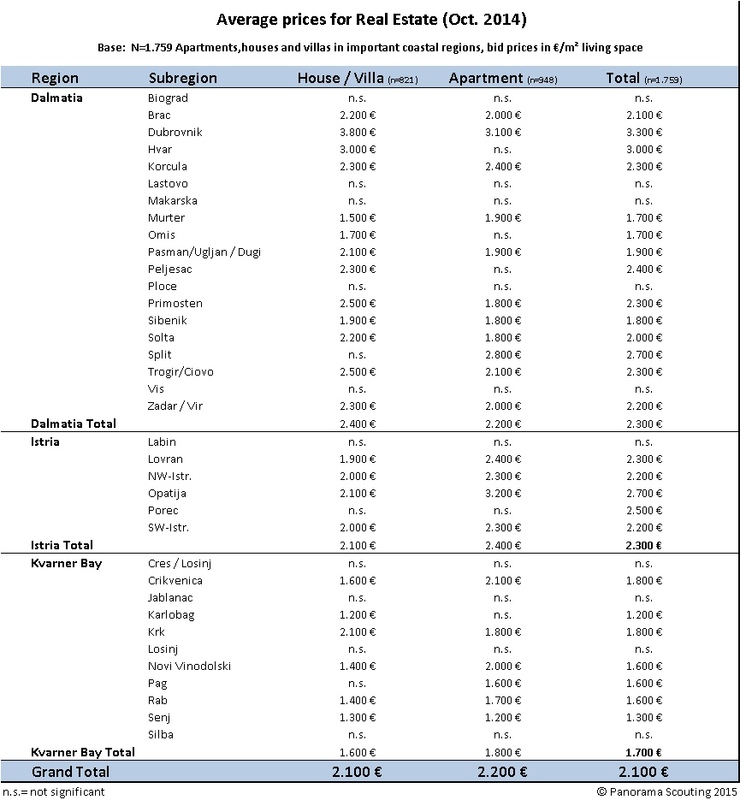 The average price per square meter for apartments amount approx. 2200 €, - which is slightly higher than for houses / villas - reflecting the current total of higher demand for this type of property. Again, there are regional disparities: Istria leads here with approx. 2400 € / sqm, followed by Dalmatia with 2,200 € / sqm and the still relatively inexpensive Kvarner Bay south of Rijeka / Novi Vinodolski, where only about 1,800 € / m must be paid. For sea views you have to spend around 100 € / sqm more, and also the impact of the sea is less pronounced than in the houses: "Waterfront" (0-25m) costs around 2,700 € / sqm, apartments up to 100m distance from the sea amount to approx. 2.300€ / sqm and the more distant ones to 2100 € / sqm. A prognosis of property prices is of course difficult and depends on many factors: first of all, more than 25% (VAT) must be paid from January 1 for taxes on construction land plots instead of the previous 5% (real estate taxes). It remains to be seen to which extent this factor - which plays a significant role for commercial construction companies - will really strike the prices for house and apartment buyers. At the bottom line, it has a price driving role, of course. Concerning the supply side, the owners' willingness to put their property at the current low level of prices on the market, of course, depends strongly on the economic and income situation in Croatia. A clearly positive economic outlook is missing currently while an unemployment rate of more than 20% in some places weighs heavily. Much more than a silver lining at the horizon can not be identified currently. So there are not too many signs that there will be scarcity in supply in the near future. In terms of demand side, of course, a lot depends on the economic development in the EU countries. In the past years Central European buyers were somehow favored and constituted th majority of the buyers- while there was just weak demand from the Southern countries. If this continues, remains to be seen. It would also be desirable that Croatian banks come up with attractive real estate loan offers. Concerning the buyers from non-EU countries such as Switzerland, Russia, China, Arabia, etc.much depends on how Croatian legislation facilitates their access to property ownership. Another aspect is the overheated price situation in real estate in Central Europe: there are numerous people who prefer to invest in in real estate during low interest times, many of them may come up with the idea that they most likely can expect gains in Croatia on the coast in medium term. Here, of course, an image of Croatia as a secure, sustainable country is asked for. At the bottomline we we see an upward trend in prices for properties at the waterfront and for those with sea views, whereas we expect more of a sideways movement of the prices for other properties.